This turnkey system was designed to be used to assemble, inspect, and pack automotive vibration dampening mounts at a rate of 30ppm. Metal inserts were fed 2 at a time from bowl to a pick nest. Rubber grommets were also fed 2 at a time from a 2nd bowl to a 2nd pick nest. Inserts were placed first, then 2 grommets were staked on them in 8 nests attached to a timing belt indexing conveyor. The parts were lubricated and then pressed together at the next 2 stations. Completed assemblies were unloaded at the final station and then moved into positions for 100% inspection with a 2 camera Keyence vision system. Rejects were dropped individually into an internal container. Good assemblies were counted and then dropped into totes positioned below the machine. The PLC based control system included programmable full box counters, machine function and alarm history displays. 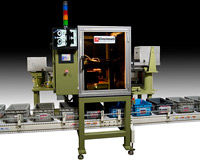 An integrated material handling conveyor was used to advance empty totes in and full totes out of the assemble-inspection machine.